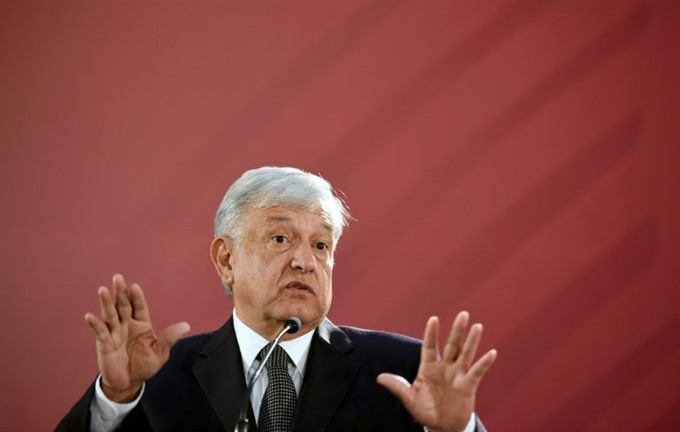 MEXICO CITY — Newly installed President Andres Manuel Lopez Obrador launched his "transformation" of Mexico on Monday with a return to presidential press conferences and a new commission to investigate the internationally condemned disappearance of 43 students in 2014. The anti-establishment leftist known as AMLO, who assumed the presidency on Saturday, got down to business with a 6am meeting with his public-security team, followed by a 7am press conference – something his predecessor, Enrique Pena Nieto, habitually avoided. He then signed a decree creating an investigative commission to unravel the unsolved case of the missing students, a stain on Pena Nieto’s legacy. "I promise you there will be no impunity, not in this terribly sad and painful case, and not in any other," Lopez Obrador said at a ceremony where the students’ parents were present. Mexico is still haunted by the disappearance of the 43 student protesters from the Ayotzinapa teachers’ college in the southern state of Guerrero. However, independent investigators found numerous holes in the official story – including a lack of forensic evidence at the supposed crime scene and indications that many of the suspects were tortured into confessing. Lopez Obrador’s nearly hour-long press conference touched on a wide range of issues. But the biggest news may have been the event itself. "We’re at your disposal to answer your questions. There are no limits, no censorship... The media are instruments to keep the people informed." The former protest leader and Mexico City mayor said both the early-morning press conference and meeting with his public-security team would be daily rituals, calling the record-breaking violence fueled by Mexico’s drug cartels "the issue that most worries Mexicans." But they have gotten off to a warm start so far – and Trump again tweeted his congratulations. Lopez Obrador also touched on his controversial decision to cancel a new US$13-billion airport for Mexico City that was one-third complete, saying bonds from the project would be repaid. He said he would give further details in Tuesday’s press conference after meeting with his finance minister, Carlos Urzua. Criticised by opponents – especially in the business world – as radical and authoritarian, Lopez Obrador has triggered fears about the future of Latin America’s second-largest economy after Brazil. In the latest report from the central bank, a panel of independent economists revised down their forecast for Mexico’s economic growth next year, from 2.2 per cent to 1.9 per cent. Vowing to lead his anti-corruption, pro-austerity push by example, he has cut his own salary by 60 per cent and forsworn the presidential residence, security detail and jet.